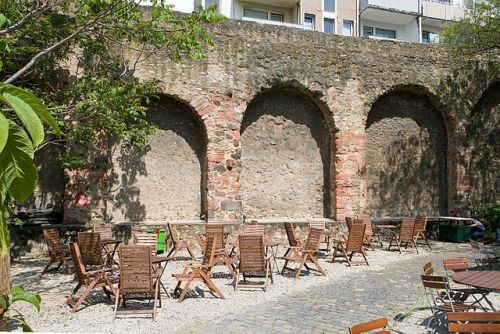 Remains of the old city wall (1138–1254) can be seen in the Fahrgasse and at the Liebfrauenkirche. Remains of the old city wall (1138–1254) can be seen in the Fahrgasse and at the Liebfrauenkirche. More prominent examples of the city fortification built in later years include the Eschenheimer Turm (1428) near Hauptwache and the Friedberger Warte (1478, rebuilt 1637), which is on the Friedberger Landstraße a bit outside the main city centre.